Stroganov is a Russian dish of sautéed pieces of meat served in a sauce with smetana (sour cream). From its origins in mid-19th-century Russia, it has become popular around the world, with considerable variation from the original recipe. After the fall of Imperial Russia, the recipe was popularly served in the hotels and restaurants of China before the start of the Second World War. Russian and Chinese immigrants, as well as United States servicemen stationed in pre-Communist China, brought several variants of the dish to the United States, which may account for its popularity during the 1950s. It came to Hong Kong in the late fifties, with Russian restaurants and hotels serving the dish with rice, but not sour cream. In the version often prepared in the USA today in restaurants and hotels, it consists of strips of beef filet with a mushroom, onion, and sour cream sauce, and is served over rice or pasta. 1) Season venison with salt, pepper and garlic powder to taste. 2) Saute onion a garlic in a large skillet with olive oil; when soft, add venison and brown. 3) Drain when venison is no longer pink and add soup. Reduce heat to low and simmer. 4) Meanwhile, bring a large pot of lightly salted water to a boil. 5) Add noodles and cook for 8 to 10 minutes or until al dente and drain. 6) In another small pan boil rice until tender, cover with lid and cool. 7) When noodles are almost done cooking, stir in sour cream and deer meat. Serve over rice and enjoy. In the UK and Australia, a recipe very similar to that commonly found in the USA has become popular, generally served with rice. British pubs usually serve the dish to a creamy white wine style recipe, whereas more 'authentic' versions are often red stews with a scoop of sour cream separately served on top. Larousse Gastronomique lists Stroganov recipe as a cream, paprika, veal stock and white wine recipe. The Brazilian variant includes diced beef or strips of beef (usually filet mignon) with tomato sauce, onions, mushrooms and heavy whipping cream. Stroganoff is also often made with strips of chicken breast or venison (deer meat) rather than beef (also called fricassee in some restaurants in Brazil). Brazilians also prepare stroganoff with chicken or even shrimp instead of beef. It is commonly served with potato sticks, as in Russia, but with the addition of white rice. Sometimes one can also see creative servings of estrogonofe, such as a crepe filling, a topping for baked potatoes, or on pizzas. Many recipes and variations exist: with or without wine, with canned sweet corn, with ketchup instead of tomato sauce, etc. 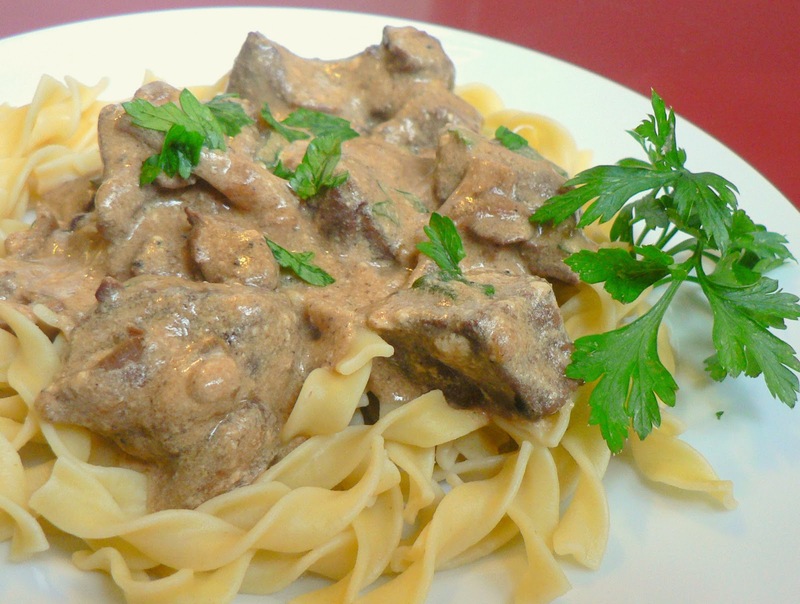 Stroganoff is also popular in the Nordic countries. In Sweden, a common variant is korv-stroganoff (sausage stroganoff), which uses the local falukorv sausage as a substitute for the beef. In Finland, the dish is called makkarastroganoff, makkara meaning any kind of sausage. Beef stroganoff is, however, also a common dish. Diced brined pickles are also a normal ingredient in Finnish stroganoff. Stroganoff's popularity extends to Japan, where it is most commonly served with white rice, or white rice seasoned with parsley and butter. Its popularity increased dramatically with the introduction of "instant sauce cubes" from S&B corporation. These are cubes with dried seasoning and thickening agents that can be added to water, onion, beef, and mushrooms to make a stroganoff-style sauce. Additionally, Japanese home recipes for stroganoff frequently call for "non-traditional" Japanese ingredients, such as small amounts of soy sauce. Beef Stroganoff is popular in Iran, where it is made with strips of lean beef fried with onion and mushroom, then further cooked in cream and topped with French-fried style potato crisps.